One of the Padma Shris this year will be conferred on a tea garden worker from Jalpaiguri (Dooars) who is a one-man bike ambulance service and has taken at least 3,000 people to hospital for free since 1998. Losing his mother made 53-year-old Karimul Haque, a resident of Rajadanga in Malbazar, wonder how to help people living in forest villages and tea estates in north Bengal where ambulances are hard to summon in a medical emer-gency. Malbazar is about 50km from Jalpaiguri town. Jafurannessa, Karimul's mother, died in 1995 of a heart attack because he could not arrange for an ambulance in time to take her to a hospital. "She died at home," Karimul said today after coming to know that one of the country's highest civilian honours would be conferred on him. "I tried my best but could not get an ambulance for her." "After her death, I thought about the problem that thousands of people in the remote areas of Malbazar face, particularly in forest villages and tea estates. I realised many people, particularly the poor, often die for lack of proper treatment," he said. He saved money and bought a motorcycle in 1998. Since then, Karimul has ferried several thousand in Malbazar to hospital for free. Patients and sometimes a family member ride pillion on the bike. Karimul said he never charged anyone and was ready to take patients to hospital even at midnight. 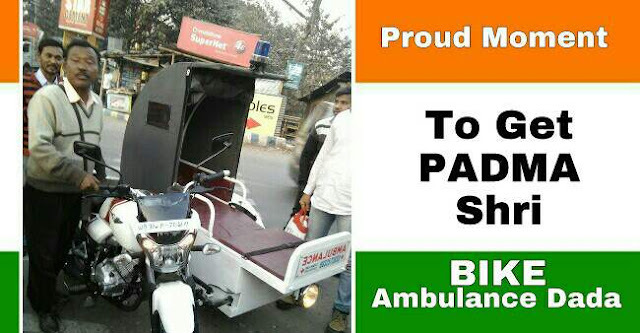 Those in need of his "bike ambulance" call Karimul on his cellphone. "I have left home at midnight to take people to hospitals. I never give it a second thought when I get a call. I cannot forget my mother's death," he said. So far, he has taken over 3,000 patients to nearby health centres and hospitals. "In many remote places, there are no proper roads for an ambulance to go there. But I can reach there with my motorcycle, take the patient as the pillion and leave for hospital," he said. Karimul's means are meagre. He works in a small tea plantation, Subarnapur, a job that gets him Rs 4,000 a month. Most of the salary is exhausted in buying fuel for the bike, Karimul said. He lives with his wife Anjuya Begum, two sons Rajesh and Raju and his daughters-in-law. His sons have a betel leaf shop and a cellphone repairing store in Rajadanga. Their earnings sustain the family. "We do not stop him as he feels satisfied by providing this service. Several days we hear his bike roaring out of our home in the wee hours but we never stop him. Also, in these days, residents of several villages and tea gardens bank on my father's service," Rajesh said. Rajadanga, Dhalabari, Kranti and Changmari - all located on the outskirts of Malbazar town - are some of the areas from where Karimul gets SOS calls. Today, Karimul got a call from Delhi. "Somebody spoke to me in English and then in Hindi and informed me about the Padma Shri. I had no idea about the award but later, some local people told me about it. If I am getting it for my work, I would dedicate it to my mother, who inspired me to help the poor and ailing people with her life," he said.